Applications of Machine Learning can be used to analyze biological data without the need of advanced programming skills. For example, Machine Learning techniques can be used to construct predictive models based on a set of training examples, to remove noise and spurious artifacts from data (e.g. photobleaching), or to help visualize trends within high dimensional datasets, etc. First, this workshop introduces the basic principles involved in the applications mentioned above, such as pattern recognition, linear and non-linear regression, and cluster analysis. This workshop will be oriented towards hands-on activities, starting from the basics of how to load and prepare biological datasets in a Python environment. By the end of this workshop, students will be able to use Scikit-Learn’s documentation (and other libraries) to build models based on their own data, assess their performance, and make new predictions. 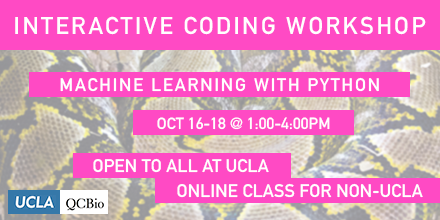 Although no advanced knowledge will be assumed, students are encouraged to attend to the Advanced Python and Modern Statistics workshops.